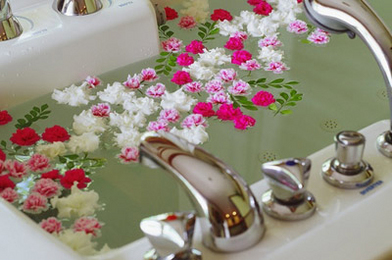 Oil added to the bath helps to soften and nourish dry, damaged or stressed skin. The warmth of the bath helps the oil to be absorbed into the skin and provides an excellent moisturizing effect. You can add any plain, herbal-infused or scented carrier oil to your bath. The carrier oils offer emolliency and nourishment for your skin, while essential oils promote various subtle energetic effects. Oil may also be added to a bath for nervous conditions, since it is said to nourish and protect the nerves. Add oil to bathwater prior to immersion. Some good choices are coconut, olive, sesame or jojoba oil. This is a well-balanced oil blend for most skin types. It is nourishing and soothing and it is not too heavy or light. It provides an excellent base for the Aromatherapy Bath Oils that follow. This oil blend may also be used directly on the skin. Pour oils in a jar, cap with a tight fitting lid and shake well. Add 1 oz. oil per bath. Makes 7 oz. You can create a wide assortment of aromatherapy oils for the bath by adding essential oils to the Basic Bath Oil Blend just described, or to any other carrier oil of your choice. These oils can also be used for massage. Use 1-2 teaspoons of Aromatherapy Bath Oil per bath. Note that the concentrated essential oils make the carrier oil stronger, so less oil is needed for the bath. Fill small-mouth jar with carrier oil, leaving 1/8 inch of space at the top. Add the essential oils drop by drop, cap the jar with a tight-fitting lid and shake well. Use 1-2 teaspoons of oil per bath.